@Glazius Awesome! I should probably re-read Do and play it with my people here. @Anaphory Yeah, specifically, every turn results in a sentence being written down to further the written record of the session. The player whose turn it is uses the stones to determine if their character helps someone (player writes the sentence) or gets in trouble (everyone else collaborates to write the sentence). And as Glaze said, the sentence moves you toward the conclusion depending on whether you can put the letter's keywords into it. Drama & Disappointment: subgenre of epic fantasy novels where the author finally corrects the way his campaign SHOULD have gone if only Carla the GM wasn't such a tool. Is there any Pathfinder economy expert here? I have a question I've already made on the main site but I don't want to play moving goalposts with that. @kviiri which RPG elements are you looking to capture with this recommendation? Hrmm... if Cardhunter existed in physical form I'd recommend that. Ten years old... Descent is exactly the type of product, but might be a bit of overkill. I don't know the franchise well enough to know if any of the ten or so different games are more of an introductory complexity. Ditto Gloomhaven, only more so. Geez... this seems like an underdeveloped niche!? You're tourists in historical Japan, competing to have the best vacation by collecting art, eating awesome food, seeing the sights, and still having enough money for the next inn. Yeah--is "fantasy-adventure RPG feel" a part of what's desired, or are all of us other than BESW just reading that onto it? Unfortunately sufficiently foreign real-world fiction often feels fantastical (just ask Okorafor). But yeah, I was kinda deliberately challenging the unspoken "RPG = fantasy" assumption. It is a sufficiently vague statement. @kviiri Speaking of which, Greedy Dragons is a card game but might qualify. @kviiri Evil Hat has other games, too: Race to Adventure! might be the right sort of thing. @kviiri One Deck Dungeon. Solitaire or multiplayer, and as a bonus all the characters are ladies. [grin] I don't think a game needs any specific quality to be an RPG. Like most things with social definitions, there are few or no necessary qualities; RPG qualities are more like a tag cloud and the more tags your game hits the more RPG-like it is but there's no solid boundary between "is" and "isn't," and no tags that MUST be included. not even "you play a role"? That's sufficiently broad that Monopoly counts. I argue that an RPG must necessarily have that, not that having it makes something "An RPG"
You may be right, but that particular formulation isn't very helpful. You can play the "role" of goalie or shortstop or catcher. ...It might be a fun exercise to try writing a game that toes the line of multiple common definitions of RPG. Call it "RPG: The Argument-Sparker." Anyway, yes, this makes it hard to recommend games for Kviiri's colleague. If we knew what media the niece enjoys, we could infer with more accuracy what she means by "RPG-like." @BESW I am – remotely – reminded of Vincent Baker's answer to Epidiah Ravachol's game “What is a Roleplaying game?”. It does not break multiple common definitions, but gives an entirely different one from the original game. The Forge poked these ideas a lot too, but in its uniquely impenetrable jargon. I'm very much not surprised. 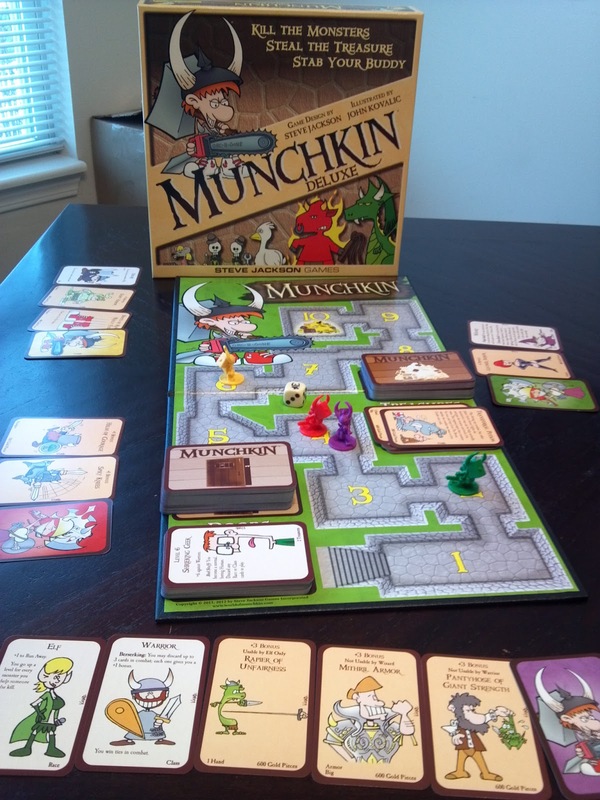 @kviiri wait, has anyone mentioned Munchkin? Well, it's not a board game? What would you use a board for? It's pretty firmly a card game. It's just a fancy level-tracking prop. @ACuriousMind Yeah, I always tracked level with d20s until some new players showed up with a fancy board. But like, assuming we all classify it as a card game,.. should that disqualify it outright? @trogdor Well...if card games can be "RPG-like board games", then why can't traditional RPGs? Hm? The original question asked for a "RPG-like board game". If we're allowing non-board games as an answer, what disqualifies any game? It's down to the rules set, I think. If you play Munchkin or One-Deck Dungeon or Cutthroat Caverns nobody's got to come up with the game. It's just you're trying to clear the dungeon/get to level 10 first/get the most money, every time. The difference between board game and card game is an accident of components. This is exactly how I think of it. There's a vast, continuous, many-dimensional space around the qualities that an activity can have, and there's a small part of that space (say, *Creature*: the *Noun* games) that most of the people familiar with the things in that space say "yeah, that's an RPG" and there's lots of that space (say, the card game Bridge or a game of soccer) where most of the people familiar with the things in that space say "nah, that's not an RPG..."
@nitsua60 I think I first grabbed onto that "cloud of tags" concept when trying to describe Doctor Who and the regenerating character to someone, but it's been very useful in a lot of semantic contexts. @BESW I recently wrote a distinctly un-fun RPG. I think. It's definitely un-fun. Whether it's a game or whether it's really role-playing... I'm not entirely sure on those fronts. "The Worm" was a very different persona than him in real life. @nitsua60 how'd you end up with that?